Three medicines treating HIV, pain and cancer have been recommended for approval by the European Medicines Agency’s (EMA) Committee for Medicinal Products for Human Use (CHMP) at its latest meeting. Gilead’s Biktarvy (bictegravir/emtricitabine/tenofovir alafenamide) was endorsed as a treatment HIV-1 infection. The once-daily single tablet regimen has shown high rates of virologic suppression and no treatment-emergent resistance through 48 weeks in Phase III clinical trials involving treatment-naïve adult patients and among virologically suppressed adults who switched regimens. The marketing application contains data from four Phase III studies in which the regimen met its primary goal of non-inferiority to ViiV Healthcare’s flagship drug dolutegravir (DTG) at 48 weeks. The therapy was approved in the US in February. The CHMP also recommended approval of one hybrid medicine, FGK Representative Service GmbH’s Dzuveo (sufentanil), for the treatment of pain. Hybrid applications rely in part on the results of preclinical tests and clinical trials for a reference product and in part on new data. The opioid produces analgesia by activating μ-opioid receptors primarily within the central nervous system, and its most common side effects are nausea, vomiting and pyrexia. Elsewhere, the Committee voiced its support for Obvius Investment BV’s generic medicine Carmustine Obvius (carmustine), for the treatment brain tumours, non-Hodgkin’s lymphoma and Hodgkin’s disease. This entry was posted in Analgesics, CHMP, Clinical Trials, EMA, Haematology, Oncology, Virology on May 1, 2018 by admin. The first stage of separation for the EMA from the UK came with the decision to relocate its headquarters to Amsterdam, and now the second stage has taken place whereby the EMA has reassigned the MHRA’s role vetting medicines to other countries. All of this has been brought about by Brexit; the surprise decision to go ahead with uncoupling the EMA’s medicine verification process from the MHRA immediately after the deadline for Brexit will have brought even more uncertainty for UK industry. It was expected that this decision may have been left until the end of the transition period, which will continue until the end of 2020. However, the EMA has already been swift to react to Brexit – first by announcing immediately that it would be seeking new headquarters and now by preparing early for life possible without the aid of the MHRA by March 2019. Mike Thompson, Chief Executive of the ABPI, said: “Given that the MHRA assesses up to 20% of EU medicines, it is clearly in the EMA’s interest to continue to draw on its expertise. It would also be disadvantageous for the EU to be unaligned with the UK as the largest biopharmaceutical cluster outside of the US. Theresa May had previously suggested, in a speech at the beginning of March 2018, that her government wanted the UK to be closely linked with the EMA, but this move by the EMA looks to have potentially disrupted that wish. It could prove to be problematic to industry, if drug approvals are slowed down by the process of other member states learning to cope with new burdens, but the main concern for the UK is that it risks isolating industry based in the country, which includes giants such as GSK and AstraZeneca, as well as many other smaller companies. The flipside to this equation is that, for the EMA, any uncertainty that is dependent upon political wrangling at the national level could spell disaster for the agency’s work if agreements are not reached. It is therefore understandable that the agency has forged ahead of relocating the 370 medicines that the MHRA and Veterinary Medicines Directorate (also UK-based) are currently rapporteur or co-rapporteur on. This entry was posted in ABPI, Brexit, EMA, MHRA, Veterinary Medicine, VMD on April 24, 2018 by admin. Commonly prescribed drugs called fluoroquinolones cause rare, disabling side effects. Researchers are struggling to work out why. In 2014, Miriam van Staveren went on holiday to the Canary Islands and caught an infection. Her ear and sinuses throbbed, so she went to see the resort doctor, who prescribed a six-day course of the popular antibiotic levofloxacin. Three weeks later, after she had returned home to Amsterdam, her Achilles tendons started to hurt, then her knees and shoulders. She developed shooting pains in her legs and feet, as well as fatigue and depression. “I got sicker and sicker,” she says. “I was in pain all day.” Previously an active tennis player and hiker, the 61-year-old physician could barely walk, and had to climb the stairs on all fours. Since then, she has seen a variety of medical specialists. Some dismissed her symptoms as psychosomatic. Others suggested diagnoses of fibromyalgia or chronic fatigue syndrome. Van Staveren is in no doubt, however. She’s convinced that the antibiotic poisoned her. She’s not alone. Levofloxacin is one of a class of drugs called fluoroquinolones, some of the world’s most commonly prescribed antibiotics. In the United States in 2015, doctors doled out 32 million prescriptions for the drugs, making them the country’s fourth-most popular class of antibiotic. But for a small percentage of people, fluoroquinolones have developed a bad reputation. On websites and Facebook groups with names such as Floxie Hope and My Quin Story, thousands of people who have fallen ill after fluoroquinolone treatment gather to share experiences. Many of them describe a devastating and progressive condition, encompassing symptoms ranging from psychiatric and sensory disturbances to problems with muscles, tendons and nerves that continue after people have stopped taking the drugs. They call it being ‘floxed’. For decades, regulatory agencies and the medical profession were sceptical that a brief course of antibiotics could have such a devastating, long-term impact. But after persistent campaigning by patient groups, attitudes began to change in 2008, when the US Food and Drug Administration (FDA) announced the first of what would be a series of strong alerts about the side effects of fluoroquinolone drugs, including tendon rupture and irreversible nerve damage. In 2016, the agency accepted the existence of a potentially permanent syndrome that it calls fluoroquinolone-associated disability (FQAD), and recommended that the drugs be reserved for serious infections. That move has triggered other regulatory agencies to reassess the antibiotics: Health Canada warned doctors of rare cases of persistent or disabling side effects in January 2017, and the European Medicines Agency (EMA) is expected to publish the results of a safety review this year, after a public hearing planned for June. Fluoroquinolones are valuable antibiotics, and safe for most people. Yet they are so widely prescribed that their side effects might have harmed hundreds of thousands of people in the United States alone, say scientists who are working with patients to unpick FQAD’s causes. Fluoroquinolone toxicity, they say, provides a compelling example of an emerging understanding that antibiotics don’t just harm microbes — they can severely damage human cells, too. Until recently, investigations into the side effects of antibiotics have focused on how the drugs disrupt the human microbiome, says James Collins, a medical engineer at the Massachusetts Institute of Technology in Cambridge. “Antibiotics are also disrupting our cells, and in pretty hefty ways,” he says. Quinolone antibiotics, first developed in the 1960s, kill bacteria by blocking enzymes called class II topoisomerases, which normally untangle DNA during cell replication. These enzymes usually cut DNA’s double helix, pass another part of the strand through the gap, and then mend the cut. But quinolones bind to the enzymes, preventing them from mending their cuts. In the 1980s, researchers added fluorine atoms to the quinolones’ structures. This allowed the antibiotics to penetrate tissues throughout the body, including the central nervous system, and boosted their effectiveness against a broad range of bacterial infections. Some FDA-approved fluoroquinolones were swiftly withdrawn from the market after severe adverse reactions and several deaths — trovafloxacin, withdrawn in 1999, damaged livers, for instance. But others became the drug of choice both for serious infections and for routine complaints, despite rare side effects. “These are heavily used drugs because they are very effective,” says Joe Deweese, a biochemist who studies topoisomerases at Lipscomb University College of Pharmacy in Nashville, Tennessee. In the 1990s, ciprofloxacin (cipro) was given to US troops serving in the Persian Gulf as prophylaxis in case of exposure to anthrax spores. And in 2001, sales of cipro surged after a series of terrorist attacks involving anthrax; the US Centers for Disease Control and Prevention (CDC) recommended a 60-day course for anyone at risk of being exposed. But by that point, some people had already flagged potential problems. In 1998, US journalist Stephen Fried (now at Columbia Journalism School in New York) published a book called Bitter Pills about his wife’s severe and long-lasting neurological reaction to ofloxacin. It helped to trigger a wave of reports on websites such as the Quinolone Antibiotics Adverse Reaction Forum, which by 2001 hosted more than 5,000 posts. The late Jay Cohen, then a psychiatrist and medical researcher at the University of California, San Diego, contacted patients through the sites and published 45 case studies. Cohen warned that after taking fluoroquinolones, some people had developed serious problems in multiple organs. These effects came on rapidly and lasted for months or years. Cohen’s work was largely dismissed at the time because of his reliance on online forums. But complaints and patient petitions continued. From the 1980s to the end of 2015, the FDA received reports from more than 60,000 patients detailing hundreds of thousands of ‘serious adverse events’ associated with the 5 fluoroquinolones still on the market (most commonly tendon rupture, as well as neurological and psychiatric symptoms), including 6,575 reports of deaths. The FDA says that the reports of adverse events it receives — sent in by drug manufacturers, by doctors and directly by consumers — cannot be used to reach conclusions about the severity of problems associated with drugs. Still, the fluoroquinolones have attracted more complaints than other more widely used antibiotics. And only 1–10% of adverse events are estimated to be reported to the FDA, suggesting that fluoroquinolones might have harmed hundreds of thousands of people in the United States alone, says Charles Bennett, a haematologist at the University of South Carolina’s College of Pharmacy in Columbia. Bennett is also director of the Southern Network on Adverse Reactions, a state-funded pharmaceutical-safety watchdog, which has been working with people affected by fluoroquinolones since 2010. In 2008, the FDA announced ‘black box’ warnings of tendon rupture among those given the antibiotics; in 2013, it added a risk of irreversible nerve damage. (Such warnings are placed inside a black box on drug labels, and call attention to serious or life-threatening risks.) As alerts mounted, patients launched lawsuits against manufacturers of the drugs, claiming they had not been adequately informed of risks. These cases have been variously won, lost or settled for undisclosed sums, and many are still in progress; manufacturers argue that they handled risks appropriately, and work with the FDA to update safety labels. In November 2015, the FDA voted to recognize FQAD as a syndrome on the basis of 178 cases that the agency regarded as clear-cut: otherwise healthy people who took fluoroquinolones for minor ailments and then developed disabling and potentially irreversible conditions. 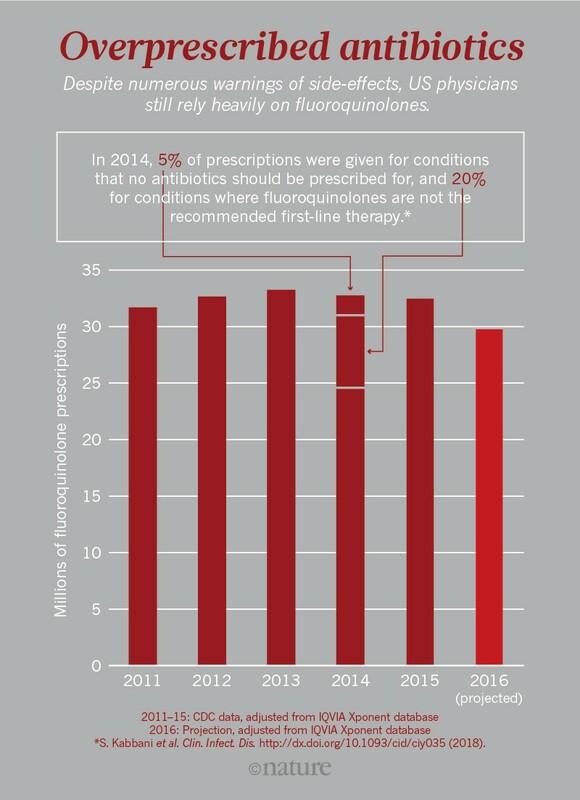 The FDA also noted a disturbing pattern: fluoroquinolones had a much higher percentage of disabilities among their serious-adverse-event reports than did other antibiotics. Beatrice Golomb at the University of California, San Diego, has been working for a decade with people affected by fluoroquinolones, beginning with David Melvin, a police officer and keen cyclist who had to use a wheelchair after he was given levofloxacin for suspected epididymitis in 2007. Accumulating evidence, Golomb says, suggests that fluoroquinolones are damaging mitochondria, the power packs inside human cells that evolved from symbiotic, bacteria-like cells billions of years ago. This kind of harm can affect every cell in the body, explaining why a wide range of symptoms can appear and get worse over time. Mitochondrial toxicity is a problem with many classes of drug, says Mike Murphy, who studies the biology of mitochondria at the University of Cambridge, UK. But because mitochondria retain some similarities to their bacterial ancestors, antibiotics can pose a particular threat to them. Researchers have shown, for example, that aminoglycoside antibiotics can cause deafness by damaging mitochondria in the hair cells of the ear. Isolated studies from the 1980s onwards have suggested that fluoroquinolones impair mitochondrial function, but a 2013 study by Collins and his colleagues is the most convincing, researchers say. They reported that antibiotics in several classes triggered oxidative stress — a build-up of reactive, oxygen-containing molecules — in mitochondria, inhibiting their function across a range of mammalian cells, as well as in mice. “We were surprised at how strong the effect was and how common the effect was across the different classes,” Collins says. But “the largest effects were seen in the quinolones”. Pharmaceutical researchers had spotted the issue, too: in 2010, toxicologist Yvonne Will and her colleagues at Pfizer in Groton, Connecticut, reported an assay to detect mitochondrial damage early in drug development. They found that some antibiotics affected mitochondria and others didn’t. Every fluoroquinolone they tested damaged mitochondria in human liver cells — having what the researchers described as “a strong effect” at therapeutic concentrations, although Will cautions that it isn’t possible to extrapolate from that result to clinical outcomes. But the potential for mitochondrial damage still isn’t widely appreciated among antibiotics researchers and the medical community, Collins says. “I think people generally assume that antibiotics do not impact mammalian cells,” he says. One problem is that there is still no reliable biomarker that researchers can use to test for mitochondrial damage in people, tying cell-line research to clinical experience. Nor is it known precisely how the fluoroquinolones are damaging human cells. A 2013 FDA review of the antibiotics’ safety, for example, cited a 1996 study reporting that cipro caused DNA breaks in mitochondria in a variety of mammalian cell lines. But Neil Osheroff, a biochemist at Vanderbilt University in Nashville, Tennessee, who studies fluoroquinolones, is doubtful about that result. He has done his own lab tests, and found that, at therapeutic concentrations, the fluoroquinolones prescribed by doctors have very little effect on human DNA. Meanwhile, mitochondrial damage isn’t the only theory in play: a 2015 study, done on human kidney cells, reported that fluoroquinolones can bind to iron atoms from the active sites of several enzymes that modify DNA, leading to epigenetic changes that might be related to some of the drugs’ side effects. At a conference last September, Bennett reported preliminary data that might hint at why only some people develop serious side effects from fluoroquinolones. He took saliva samples from 24 people who reported neuropsychiatric side effects — such as memory loss, panic attacks and depression — and found that 13 of them (57%) shared a gene variant usually seen in only 9% of the population. Bennett is not revealing the gene’s identity because he has a patent application in process, but he says that it seems to be a site related to poor metabolism of the quinolones. Such a mutation might cause dangerously high levels of the drug to accumulate in cells, including in the brain. Bennett is now conducting a trial with 100 more participants to see if he can replicate the result. If so, that might lead to a genetic test to identify people who should not be given the drugs. Most scientists asked by Nature about fluoroquinolones said that more research is needed to understand their side effects. Collins hopes to explore mitochondrial damage by antibiotics in other animal models. He and Murphy have also found, in lab studies, that giving antioxidants alongside fluoroquinolones seems to mitigate the effects on mitochondria. Murphy is interested in trials to avoid mitochondrial toxicity in drugs; he owns shares in a company that aims to set some up. But such trials are difficult and expensive, particularly for drugs that are given in sometimes life-threatening situations, he says. Golomb is currently conducting an unfunded online survey to gather information on the experiences of thousands of patients. She hopes that it will lead to hypotheses about what might mitigate harms that could then be tested in clinical trials. But little support is available. That’s typical for research on drug safety. Investigating medications that have been on the market for years isn’t a priority for research agencies such as the US National Institutes of Health, says Bennett. Manufacturers don’t have an incentive to fund post-market safety studies, particularly for off-patent drugs such as cipro and levofloxacin, where the vast majority of sales are from generics firms. “So there is really nobody to champion this work,” says Bennett. Another factor is scientists’ reluctance to publish results that drug companies might find unfavourable. “There’s a long history of adverse action against people who expose drug and chemical harms,” says Golomb. She cites a list made by the pharmaceutical firm Merck of doctors who criticized the anti-inflammatory drug Vioxx (rofecoxib), which was withdrawn from the market over an increased risk of heart attack and stroke. According to internal e-mails read out in court in 2009 as part of a Vioxx class-action case in Australia, a list e-mailed among Merck employees contained doctors’ names with the labels “neutralize”, “neutralized” or “discredit” next to them. (Merck did not respond to Nature’s request for comment.) Aggressive tactics are “a very big problem”, says Bennett, who says he has been threatened by drug companies in the past. For Osheroff, there are more-pressing concerns about fluoroquinolones, such as how to combat the emergence of antibiotic-resistant infections and develop new antibiotics. But he and other scientists agree that doctors should not prescribe fluoroquinolones for relatively minor infections when they could use other drugs. The FDA’s warnings on drug labels, however, have been slow to produce results. Prescriptions for the drugs did not fall between 2011 and 2015, according to the CDC (see ‘Overprescribed antibiotics’). This suggests, says Bennett, that official alerts haven’t been enough to get physicians to change their habits. The labels for fluoroquinolones alone have changed around 20 times in the past 4 or 5 years, he says. “It is almost impossible for doctors to keep up.” Still, US prescriptions of fluoroquinolone antibiotics did drop by around 10% in 2016, and totals for the first half of 2017 suggest that prescriptions fell again last year, according to unpublished figures given to Nature by IQVIA, a health-data firm in Durham, North Carolina. This entry was posted in EMA, FDA on March 23, 2018 by admin. MSD has announced the launch of Ontruzant®▼, (trastuzumab), a biosimilar referencing Herceptin® (trastuzumab/TRZ), for the treatment of early breast cancer, metastatic breast cancer and metastatic gastric cancer. This was the first trastuzumab biosimilar to receive regulatory approval in Europe and is the first to launch in the UK. Biosimilar trastuzumab represents the first product approved in the UK under a global biosimilars development and commercialisation agreement between MSD and Samsung Bioepis Co Ltd. The European Medicines Agency (EMA) requires biosimilars to show they are highly similar to the reference medicine in terms of structure, biological activity and efficacy, safety and immunogenicity profile. Ontruzant (trastuzumab biosimilar (SB3)) is a monoclonal antibody and has been shown to have similar safety and efficacy as its reference product Herceptin (TRZ) in early breast cancer, with breast pathologic complete response rates (bpCR) being 51.7% and 42.0% with SB3 and TRZ respectively. The adjusted ratio of bpCR was 1.259 (95%CI, 1.085 to 1.460), which was within the predefined equivalence margins. The adjusted difference was 10.70% (95% CI, 4.13% to 17.26%), with the lower limit contained within and the upper limit outside the equivalence margin. The overall response rates were 96.3% and 91.2% with SB3 and TRZ. “As a company committed to inventing new treatment options for both common and neglected types of cancer, MSD is also pleased to be offering the NHS a biosimilar medicine in an established area of care. Biosimilar trastuzumab marks a significant milestone for both MSD and the oncology community, providing the UK’s first biosimilar trastuzumab, based on our collaboration with Samsung Bioepis,”explains Louise Houson, UK Managing Director, MSD. Regulatory approval was based on a Phase III study that compared SB3 with reference TRZ in patients with human epidermal growth factor receptor HER-2 positive early breast cancer in the neoadjuvant setting. The study showed the total pathologic complete response rates were 45.8% and 35.8% and the overall response rates were 96.3% and 91.2% with SB3 and TRZ, respectively. Eight hundred patients were included in the per-protocol set (SB3, n = 402; TRZ, n = 398). The bpCR rates were 51.7% and 42.0% with SB3 and TRZ, respectively. The adjusted ratio of bpCR was 1.259 (95%CI, 1.085 to 1.460), which was within the predefined equivalence margins. The adjusted difference was 10.70% (95% CI, 4.13% to 17.26%), with the lower limit contained within pre-specified equivalence margins and the upper limit of the confidence interval slightly exceeding the pre-specified equivalence margins (-13%, 13%). Overall, 96.6% and 95.2% of patients experienced one or more adverse event, 10.5% and 10.7% had a serious adverse event, and 0.7% and 0.0% had antidrug antibodies (up to cycle 9) with SB3 and TRZ, respectively. This entry was posted in Biologics, Biosimilars, Collaborations, Drug Development, EMA, Immunology, Oncology, Pharmaceutical on March 15, 2018 by admin. UK-based specialist Amryt Pharma is looking to expand in 2018 after acquiring two rare disease treatments. A relative newcomer to the niche rare disease market, Amryt Pharma was founded by former Astellas medical director Joe Wiley and financier Rory Nealon in August 2015, who spotted an opportunity to develop products in under-served orphan disease therapy areas. The Irish duo in-licensed their first product, Lojuxta from Aegerion in December 2016, and have since increased its revenues by more than 50%, as well as building a corporate team and European operations. Lojuxta is licensed to treat the rare, life-threatening disease called Homozygous Familial Hypercholesterolemia (HoFH), and Amryt has marketing rights for the drug in the EEA region, as well as Israel, Turkey and MENA markets. The company also has in its pipeline AP101, a promising product candidate currently in a pivotal trial for epidermolysis bullosa, a rare and debilitating skin condition. Amryt expect to bring the product to the US and European markets by 2020, and believe the global market to treat the condition is worth around $1 billion annually. “This is an exciting time of growth and expansion for us. Rare disease companies often start up in the US and then enter the European market, but our origins mean we have a deep understanding of what’s required and the nuances of doing business in the pharmaceutical space in Europe,” said Joe Wiley. The privately-held company is expected to look for further growth this year, and this includes interest in further in-licensing deals. Meanwhile, the company is planning a paediatric study for Lojuxta and is currently awaiting sign off for its study design from the EMA. The company is also pursuing additional licences for AP101. As for expansion into the US, the company says it already has its first “boots on the ground” in the US and in Latin America, its teams there establishing the opportunities in the market and meeting with relevant stakeholders. “The EB market is particularly appealing in the US – there are approximately 20 centres focusing on EB, therefore it makes it easier for a small, agile company like Amryt Pharma to work closely with them,” says Wiley. The design of the global trial for AP101 has already been agreed with the FDA, and the company is currently completing the pre-clinical package and preliminary safety data set the US regulator has requested in order to open the IND specific to the US. Amryt won’t have the EB market to itself, however, and a number of companies are developing novel treatments for the condition. These include US-based Fibrocell Science, which has just got the green light to begin phase 2 trials of its gene therapy candidate FCX-007 for recessive dystrophic epidermolysis bullosa (RDEB). Another company in the field is Netherlands-based ProQR Therapeutics, which is working on an RNA-based therapy for dystrophic epidermolysis bullosa (DEB). Interim analysis of the data from Amryt’s EASE trial will be available later in 2018, followed by top-line analysis. The company expects to compile its submissions to the FDA and EMA shortly thereafter, with marketing authorisation in Europe and US anticipated late 2019, or possibly early 2020. This entry was posted in Clinical Research, Clinical Trials, Dermatology, Drug Development, EMA, Paediatrics, Pharmaceutical on March 8, 2018 by admin. First European filing acceptance of a selective sodium glucose cotransporter-2 (SGLT-2) inhibitor in type-1 diabetes. AstraZeneca has announced that the European Medicines Agency (EMA) has accepted the Marketing Authorisation Variation for Forxiga (dapagliflozin), a selective SGLT-2 inhibitor, for use as an oral adjunct treatment to insulin in adults with type-1 diabetes (T1D). The submission acceptance is based on Phase III data from the DEPICT (Dapagliflozin Evaluation in Patients with Inadequately Controlled Type 1 Diabetes) clinical programme for Forxiga in T1D. The short-term (24 week) and long-term (52 week) data from DEPICT-1, along with the short-term data from DEPICT-2, showed that Forxiga, when given as an oral adjunct to adjustable insulin in patients with inadequately-controlled T1D, demonstrated significant and clinically-relevant reductions from baseline in HbA1c, weight and total daily insulin dose at 24 and 52 weeks, compared to placebo, at both 5 mg and 10 mg doses. The safety profile of Forxiga in the DEPICT clinical programme to date is consistent with its established profile in type-2 diabetes (T2D), with the exception of a higher number of diabetic ketoacidosis (DKA) events in dapagliflozin-treated patients versus placebo in these T1D studies. DKA is a known complication for patients with diabetes that affects those with T1D more frequently than with T2D. Forxiga has the potential to become the first selective SGLT-2 inhibitor approved in Europe for the treatment of T1D as an oral treatment adjunct to insulin, helping to address a significant unmet need in this patient population. Forxiga is not currently licensed for use in T1D. The DEPICT clinical programme consists of two clinical trials, DEPICT-1 (NCT02268214) and DEPICT-2 (NCT02460978). DEPICT-1 and DEPICT-2 are 24-week, randomised, double-blind, parallel-controlled trials designed to assess the effects of dapagliflozin 5 mg or 10 mg on glycaemic control in patients with T1D inadequately controlled by insulin. All patients will be evaluated at week 24 and after a 28-week extension (52 weeks in total). Forxiga is a first-in-class selective inhibitor of human sodium-glucose cotransporter 2 (SGLT-2 inhibitor) indicated as both monotherapies and as part of combination therapy to improve glycaemic control, with the added benefits of blood pressure reductions and weight loss in adult patients with type-2 diabetes (T2D). AstraZeneca continues to push the boundaries of science with Forxiga through the largest and broadest, patient-centric clinical programme. The DapaCare clinical programme currently will enrol nearly 30,000 patients in randomised clinical trials, including a wide range of mechanistic studies, and is supported by a multinational real-world evidence study (CVD-REAL). DapaCare and complementary clinical research will generate first-in-class data for Forxiga across a spectrum of people with T2D, type-1 diabetes (T1D), established CV disease, CV risk factors and varying stages of renal disease, both with and without T2D, providing healthcare providers with the evidence needed to improve patient outcomes. DapaCare underscores our commitment to following the science with Forxiga, as the first SGLT-2 inhibitor to be studied in these diverse patient populations, pursuing a holistic patient approach to address the multiple risk factors associated with CV, metabolic and renal diseases. This entry was posted in Clinical Trials, Drug Development, EMA, Endocrinology, Pharmaceutical on March 8, 2018 by admin. Vive la révolution! What is the future of biosimilars in the UK? Harriet Lewis, ABPI’s Medicines Optimisation Lead, discusses the future of biosimilars in the UK asking the pertinent question: will they revolutionise healthcare? The ABPI represents UK-based pharma companies researching the newest and most innovative medicines. Our members make both originator biological medicines and make biosimilar medicines so, for want of a better word, we have a foot in both camps. We work to support the introduction of biosimilars but also work to ensure there is a sustainable and active competitive market. To understand why we talk about biosimilars and the biosimilar market in a unique way, it is important to take a step back. I am a pharmacist — not a scientist — so I am constantly amazed by the science behind biosimilar medicines that is both fascinating and complex. Put simply, biosimilar medicines are made from living cells and since living cells are all slightly different, there are also variations between biosimilar medicines. This so-called heterogeneity is part and parcel of biological medicines: chemical difference that do not affect the clinical effectiveness of the medicine. When producing biological medicines, companies must demonstrate the reproducibility of their drugs time-after-time and within certain parameters. Before they even get to the point of clinical trials in humans they are required to demonstrate successful reproducibility. As a result of the complexity of manufacturing and regulation, bringing these products to market is time-consuming and expensive. One of the early key discussion points around biosimilars is how they should be defined and therefore how they should be treated. Biosimilars are neither generic medicines nor novel treatments. Definitive guidance from the European Commission sets out that they are in fact a ‘version of an active substance’ within an already approved medicine. Manufacturers must convincingly demonstrate the similar nature of these products. Regulators require biosimilars to demonstrate a comparable clinical effectiveness to originator products. The European Medicines Agency (EMA) goes so far as to say that the ‘concept of biosimilarity is applicable to any biological medicinal product’. Just as with any medicines, there are class-based risks associated with a biosimilar medicine’s pharmacology, potency or bioavailabilty over time, and these are monitored on an ongoing basis. Pharmacovigilance is a necessary component to the success of biosimilars and ensures that regulators can trace where biosimilar medicines are used to track immunogenic side effects should they arise. We can only know so much about any medicine, including biosimilars, before they are licensed. Information and our understanding of how they work in patient populations is continually built-upon once the medicine become available to patients: pre-authorisation clinical studies are often insufficient in highlighting all adverse effects. Across Europe, the pharmacovigilence regulation requires that all adverse events for biologics are reported by brand name and batch number. In England, prescribers are encouraged to prescribe by brand name and NHS providers to record product name and batch number to provide an audit trial for product identification and traceability. The European biosimilars market has grown exponentially since the first medicine was launched back in 2006; there was a sudden uptick from 2012 and if you look at any timeline outlining the number of medicines launched what is abundantly clear among the many successes are also a number of failures. Once you have started manufacturing a biosimilar medicine, it isn’t a done deal that you’ll have a successful medicine. In that respect, biosimiliars are indistinguishable from originator products. There are also strict regulatory challenges for biosimilar medicines and regulators take time to assess and approve them. This is unlike generic medicines, which are often licensed relatively quickly and are made available to patients on much shorter timescales. While we are seeing a fast-growing market in biosimilars in all areas, it is also becoming apparent that they might not always be commercially viable. It has become clear from the rapid expansion of the biosimilars market, according to the QuintilesIMS European study ‘The Impact of Biosimilar Competition in Europe’, competition drives down price. The report also shows there is a relatively weak correlation between biosimilars market share and price; this is a fast-growing market that will inevitably provide complex medicines at more affordable prices, switching to biosimilar medicines may release savings in health systems that should be reinvested in patient care and not used to plug financial deficits. We know that switching from originator projects to biosimilars is being heralded by the NHS as the next step in delivering savings to health systems, although the predicted savings on the scale suggested have yet to be delivered. Actually, it’s not switching per se but the introduction of competition, in which both the biosimilar producers and originator biologic manufacturers compete (as the IMS Health study has demonstrated). Regardless, the decision to switch should be clinically-led: considerations must be made to ensure patient access to innovative new medicines and that those are made between patients, clinicians and doctors. There is also a burden associated with switching to biosimilar medicines both in the financial sense but also as a burden on the clinical support staff that need to manage the change. Education is a key part of these decisions. To support clinicians considering switch programmes there are a number of important documents setting out the process for clinician and patient engagement, including ‘Considerations for physicians on switching decisions regarding biosimilars’ a joint document from European Biopharmaceutical Enterprises (EBE) European Federation of Pharmaceutical Industries and Associations (EFPIA) and International Federation of Pharmaceutical Manufacturers and Associations (IFPMA), but also on the EMA website, to show clinicians some of these toolkits available to make informed decisions about switching. At ABPI we are working closely with our partners: the BIA, the BGMA and the BBA, as well as the regulators, to make sure that we have a sustainable and active market so that patients do actually benefit from the innovation seen in this growing field of medicines. We continue to work closely with NHS England on a range of activities to highlight how competition within the biologics market is beneficial for patients. The ABPI recently advised on a forthcoming NHS commissioning framework document which will provide guidance to NHS commissioners about biosimilar switching programmes. We look forward to seeing the final version and hope that our industry’s insight has been considered and that the benefits to patients of an effective biosimilars market here in the UK are included. The phenomenally complex manufacturing process involved in making biosimilars is really leading contemporary science in this field and could potentially revolutionise the treatment of some conditions. This entry was posted in ABPI, Biologics, Drug Development, EMA, NHS, Pharmaceutical on November 20, 2017 by admin. The European Medicines Agency is on the cusp of rolling out one of the most ground-breaking digital platforms for facilitating collaboration and efficiency in clinical trials. The clinical trial is the crucible through which all medical advancement is tested, but the traditional, established form has consistently proved to be unable to keep pace with the rapidly evolving, increasingly globalised world and the medical needs of its patients. While the system has been honed and developed over time, glaring inefficiencies still persist, especially within an international context. Where the sharing of knowledge can mean a huge leap forward for researchers and patients in a particular disease area, it’s imperative that collaboration be facilitated. For instance, rare diseases pose a particular challenge in drug development due to the miniscule patient population in any given country; only when these populations are pooled can the disease be properly examined and the efficacy of treatments accurately assessed. This is just one glaring weakness of the traditional clinical trial, which often proves to be insular and is conducted within the borders of a single particular country, adhering to one particular set of rules – rules which change from region to region. While the limitations of this approach become ever more apparent, clinicians are increasingly looking towards digital tools and systems to tackle these challenges. These e-clinical solutions, as they are known, seek to automate the clinical trial process, reducing inefficiencies and providing a more robust framework to support the application and execution of studies. In the world of e-clinical innovation as it stands, there is arguably no bigger undertaking to push the boundaries of what clinical trials can achieve than the rollout of the European Medicines Agency (EMA)’s Regulation 536/2014: a project which includes the implementation of an EU-wide database and application portal, enabling a harmonised and streamlined approach to conducting clinical trials across all constituent member states. To discover what this rollout means for the industry and the future of clinical trials, Pharmafocus contacted Fergus Sweeney, EMA’s Head of Inspections, Human Medicines Pharmacovigilance and Committees. He explained: “The portal and database is an IT tool which is required by the clinical trial Regulation 536/2014. That Regulation is to bring into place a new process for applications in the conduct of clinical trials, the management of authorisation of a clinical trial throughout its life cycle, and then to provide a platform for the submission of a summary of results. Instead, Regulation 536/2014 aims to break down these restrictions by providing, “a single set of rules and a single dossier, in particular to enable multi-state trials – those which involve investigators in more than one member state,” as Sweeney explains. “If we look at historical data, trials – particularly those of academia but also those of commercial sponsors – tend to operate in one member state, or a relatively small number of member states. This Regulation was to facilitate expert investigators in different member states working together more directly, rather than working only within the silo of their own member state. In practice, once a group has settled upon a design and goal for a clinical trial, they would then write up their protocol and other associated documents before compiling and submitting them via the online portal. Once submitted, the dossier is added to the database and will be accessible to all relevant parties across all member states. The portal also acts as a platform for correspondence between all groups; on receipt of the dossier, the appropriate authority will then assess the submission and send a consolidated set of validation questions via the portal. Once these are answered and everything is satisfactory, approval to commence the trial will be given within a fixed time period, which is set at sixty days in normal circumstances. All users of the system will have a secure login, and from there can find out what’s happening with the clinical trials they have already commenced and find new applications for trials. They will be able to assign the team who are going to assess each trial, download and review the documents from the sponsor, build their assessment report and discuss it between member states, among other things. Should any urgent or unexpected safety issues arise throughout the trial, they can be reported through the portal by the sponsor. The same is true regarding issues of non-compliance or situations calling for supervisory action – these can be addressed via processes that run through the portal. “This will rationalise everything into one submission; one interaction with the authorities; one set of questions back from the member states and sponsors, and then one approval or disapproval,” Sweeney claimed. Alongside facilitating greater harmonisation between trial conductors, the system also aims to provide much improved transparency to the public on the data generated from these studies – a key goal, argues Sweeney, as a strong rapport between the public and the scientific community proves instrumental to the success of clinical endeavours. “It’s really important for building public trust in the clinical trial and regulatory process. If you’re transparent, people can see the information available and can start to establish trust,” he asserted. “It improves understanding of the way the clinical trial process works and how they operate, and through shared information it can propel research on how to develop new, more effective or safer medicines, as well as new applications of existing medicines. It helps patients to find trials that they may need to participate in if they have a particular unmet medical need. The system requires that both a structured summary and a layperson’s summary have to be loaded within 12 months of the end of each study, and the public will have open access to all published data on any trial conducted through the portal, irrespective of whether the study was done in Europe or in some other part of the world. The statement echoes Sweeney’s assertions that the system hinges upon a fully functional and uncompromising delivery, and simply cannot be rolled out until it is up to the exacting standards required. When queried on the reason behind the delay, Sweeney was candid: “This is a very large, complex system. It is designed to operate across 28 different member states, plus the European Economic Area, and brings together ethics committees and national competent authorities in the assessment of those trials. It also has to interact with the safety reporting and safety database systems with inspection processes. Something on this scale hasn’t been done before for medicines regulation; it needs to work very efficiently and to a high level of quality in terms of protecting patients and ensuring the proper information is provided to the public, but also that there’s an efficient system there for sponsors and member states to use in applying for and evaluating applications for clinical trials. However, the far-reaching consequences of the UK’s exit from the EU are impossible to ignore, and in July the EMA released an official ‘business continuity plan’ outlining operational changes in preparation for this impact. Much of these changes included diverting resources from non-essential activities to free up staff, and instead commit them to a dedicated Brexit team. The implementation of Regulation 536/2014 is not above being affected, and Sweeney shared the agency’s stance to avoid any further delays. “We have in place a taskforce which is preparing us for the effects of Brexit and what that may mean for the relocation of the agency, and one of the things we have to do is monitor whether any of the things arising during that process would have an impact on further development. This project has a high priority within the agency and our business continuity plans – it will be given very close attention. The actual developers are not located in the UK so they should not be affected, and because the functioning of the system itself is web-based, it doesn’t matter where the data centres are. The task undertaken by the EMA is undoubtedly unprecedented and presents a wealth of obvious benefits for the future of efficiency, transparency and collaboration in medicine, despite the huge challenge to make it a reality, but is it indicative of a shift towards a more globalised era for the humble clinical trial? Could we be gazing into a future where the majority of trial operations are networked and synchronised, and international collaboration becomes the norm? It may be a long way off, but Regulation 536/2014 is certainly the first major step in the journey. It provides hope for those striving for more robust safety and efficacy assessments of medicines that are just not possible without co-ordinated, large-scale patient populations, particularly in the area of rare disease. This entry was posted in Clinical Trials, EMA, Pharmaceutical on September 29, 2017 by admin.